3 bedrooms, 2 bathrooms, living room, dining room, kitchen, den, Jekyll room. POOL PRIVILEGES. MW, DW, W/D, 3 Cable TVs, 3 DVDs, WiFi, Gas Grill. POOL PRIVILEGES @ DAYS INN, NO PETS, NO SMOKING. BEDS: 2 Queen, 2 Single, sofa bed. Accommodates 8. It was a wonderful time. House was great & at a good location for beach access. Our two weeks at the beach were pleasantly enhanced by American Pies amenities. The outside shower helped keep sand from coming inside and its spaciousness provided for a low country boil feeding thirteen. This house is an easy walk to the beach. We enjoy the use of three different sitting areas (sunroom, living room and den). The kitchen is well equipped for all your cooking needs. The back of the house faces west and so late afternoon sun can make the air conditioner struggle to keep things cool especially when cooking dinner begins. Not complaining, it is manageable if you know to turn down the temp. control midday. Too short but fun. The house is well managed. This house was clean and well appointed. It is spacious and accommodated the five of us well. We had a seafood boil for fifteen and it was great. It was beautiful , relaxing and enjoyable . Close access to beach. We watch the sun come up , high tide roll in , just a gorgeous experience. The house was perfect for our stay. Clean, roomy and great location close to beach access. We will be back and request the same house. Thank you Jekyll Realty. We come to Jekyll to ride our bicycles,visit the historic district and hopefully spy a cargo ship arriving or departing and a school of dolphins. All missions accomplished. A wonderful experience.This property is in excellent condition and the location is perfect for exploring the island.I look forward to coming often!! Our experience with American Pie is always wonderful! We have rented many different properties over the years, but this is our favorite....comfortable, clean, cozy and great location. Would highly recommend it! Thank You!! Stayed here during Shrimp & Grits Festival because our regular rental was booked. What a nice surprise. Great open layout, spacious, great lighting, and very clean. Bathrooms a bit small but suitable. Hot water tank is a bit small and we ran out of hot water during showers for 4 adults. We had a good vacation--this is a nice property, but not so nice that I have to worry about my children breaking anything. The layout of the house is good for a busy family with plenty of room to spread out. 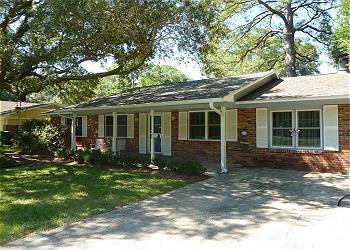 It's close to the beach, the pool, a and bike trails. This is the second time we've stayed in this house, and the upgraded, high-speed Internet was a nice surprise this time. This is a really nice house. It was clean and had lots of room. The house was well suited to our needs. It was clean and well maintained and equipped. The outside shower with bashful walls was a nice extra. Beach access was close and there was ample room alongside the house for our kayaks. Enjoyed our week at Jekyll with our new granddaughter and her family. American Pie was the perfect place for our families. The home was equipped wonderfully for our needs and located for easy bicycle access and historic district access - the reasons for our visit. Hope to stay there again in 2017.